Looking to update your business with a variety of signage? There are many suppliers, manufacturers and websites, but our company offers top quality sign supplies at wholesale pricing. The massive online selection provides affordable yet versatile choices, so every store proprietor can market efficiently. The sign supplies range from illuminated signage, snap open sign frames, exterior wall mount fixtures, poster hanging rails, office and door signs, banner hardware, sidewalk signs, screw covers, cable display systems, standoffs and more. These unique selections are each optimized for accurately informing people, like store hours, sales, specials or other events. Sign supplies, also called sign making equipment, help present custom vinyl banners, screen printing, graphics, banners or other signs. Draw more attention and exposure to any establishment. Having the most professional merchandising equipment is highly important, so check out the entire online inventory for all your promotional solutions! What kinds of sign hardware do we offer? 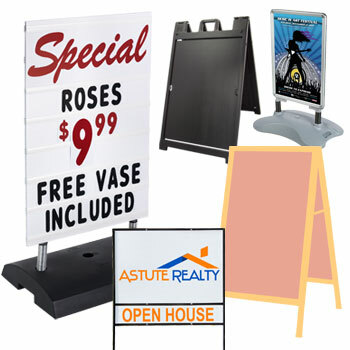 Poster rails, or banner hangers, provide a means of presenting screen printing, vinyl banners, company signs and more. They are generally used in malls, store windows and clothing boutiques. Each set of poster hangers comes in multiple sizes to fit most standard graphics. The poster rails are available in four styles: plastic economy, decorative with aluminum covers, kits with suction cups and all-aluminum "snap-rails." 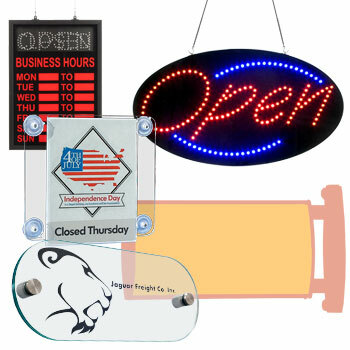 These banner hangers are simple to use, as the graphics are easily loaded and updated. Snap open wholesale sign frames are another great offering from our catalog. Show posters and artwork with style when using these sleek frames. Their aluminum finishes add a refined look to your company or business office. They also feature easy signage updates. Simply snap open all four sides of the display frame, and then insert the graphic behind the clear overlay. 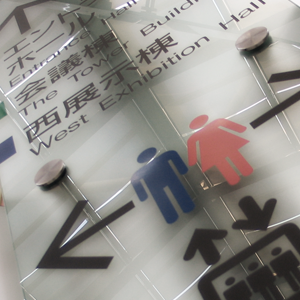 The overlay not only protects your signs from damaged, but also it is anti-glare layer. 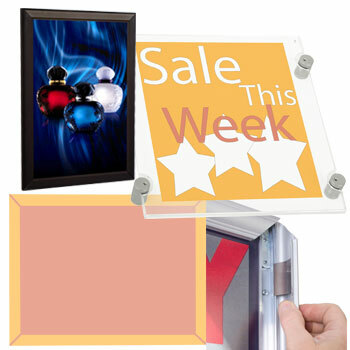 Once all four sides of the frames are snapped down, your promotion is ready to be displayed. Office and door signs are similar to snap open frames but are designed specifically for business atmospheres. They are commonly implemented in lobbies and office buildings. The DIY wall signs hold your custom inserts, announcements, room numbers, office designations and more. Each option is loaded from the front, so customizing promotional messages is simple. Swap out graphics without having to remove the entire fixtures from the wall. Develop a visual location system within these unique display frames. A related category includes both sign standoffs and decorative screw covers. Standoffs require holes to be drilled through your wood, acrylic, glass or other sign panel. These quality sign mounts provide a practical yet stylish way to mount signage or ornate panels. Although they are economically priced, standoffs bring an expensive look to any location. Screw covers are also available separately or in bulk quantities. Choose from several finishes and sizes to match your décor. 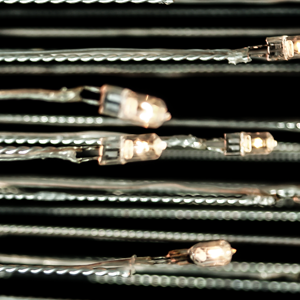 Still other options, like cable display systems are accessible in our selection. Suspended cable displays are suitable for upscale environments due to their innovative, European design. The kits integrate pre-cut and assembled cables, display holders and mounting hardware, so showcasing a company message is easy. Many of the systems can be mounted together to create a more elaborate display. Banner hardware is another great option for publicizing a store. Street pole banner kits are offered in a variety of sizes and grades to accommodate screen printing or vinyl banners. The hardware makes it easy to take advantage of telephone poles that surround your organization or business. Many college campuses develop themed displays by installing multiple hardware sets! Advertising outside a business is a crucial aspect of any successful marketing strategy, which is why sidewalk signs are such an excellent choice. They can help draw passersby into your business from out on the street. Sandwich boards and A-Frame signs are affordable fixtures that can feature quick-change snap frames, writable surfaces, insert holders, fillable or weighted bases, wheels and more. There is a size and style for every application. Exterior wall mount frames are also for sale online. This company equipment is designed with features that ensure that your signage stays safe from the elements. The outdoor sign frames can withstand the elements because of the weather gasket on each of the inside edges. 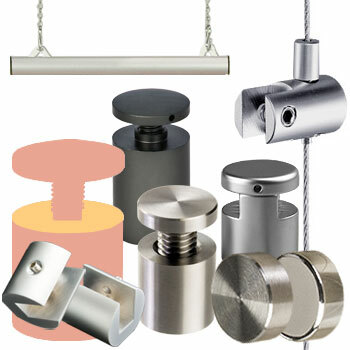 Some are even tamper-resistant because they integrate two key locks on the top and bottom corners. The front lens is UV resistant and helps prevent sun damage and fading. The swing open doors make signage updates a breeze! Last but not least is our illuminated signage equipment. The window displays show either custom advertisements or feature simple messages, like "open", "ATM", "Drive-Thru" and others. 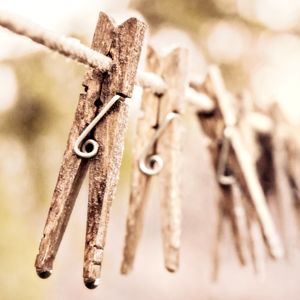 Both styles give people the information they need when considering your store or business. Lightboxes are available as writable marker boards or acrylic signage holders. The wide variety of sizes and color patterns allows business owners to find the illuminated displays that meet their establishment's needs. We provide one of the largest online selection of sign-making hardware. In addition, each product page offers a live counter that lets customers know exactly how many of each item are available for purchase. Because we maintain such an immense line of merchandise, we are able to offer same-day shipping on most in-stock orders when they are placed before 2 p.m. EST, Monday through Friday. Our customer service department is unrivaled. We offer three methods for communication: Email, Live Chat and Telephone. If you need information or simply have questions about an order, our professionally-trained support experts can help. A huge stock of quality merchandise is maintained at all times to be sure there are sign making solutions and advertising equipment options that suit everyone. Each style will get your advertisements the attention they need. Combine these industry fixtures with other displays to develop an entirely new marketing campaign! Store owners can be confident about purchasing visual merchandising equipment from our company because it is a leading wholesale supplier. As both the manufacturer and supplier, we are able to offer lower pricing on bulk orders. In addition, most in-stock items ship the same day! Some restrictions apply to custom-printed or freight-shipped items, as they cannot be expedited. Our discount prices are only beat by our excellent customer service staff. If you have any questions or comments, simply dial 1-800-572-2194. You can also participate in a live, online chat with one of our staff members. The service department is open Monday through Thursday from 8:00 a.m. to 6:30 p.m. and Friday from 8:00 a.m. to 5:30 p.m. Eastern Standard Time. If our regular business hours do not work for you, send an Email and we will respond as soon as possible! 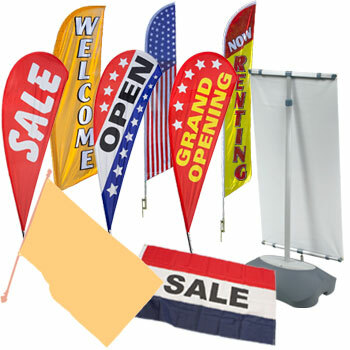 SignSupplies2Go.com is America's trusted sign making wholesaler for hanging signs, retail screen printing, banner stands, and more marketing equipment! To view a broad listing of all of our products view our site map. 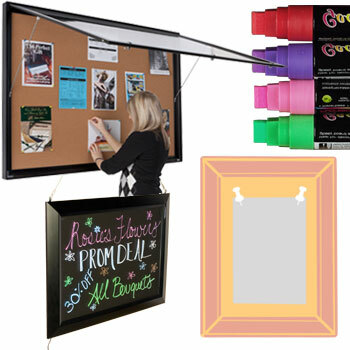 We highlight all the different hardware systems for creating attention drawing hanging advertisments. Pizza, ATM, tattoos, nails, or vacancy: if you're selling it there is an LED sign for your store! We explore the world of ad design with sign standoffs from simple signs to creative designs. 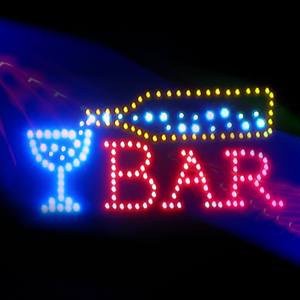 From LED to T5, we cover all the different styles of both indoor and outdoor lite-up advertising signs.